A dossier of defensive errors sees Senegal bow out even though it was an even match on the general direction of play. In the unlikeliest of ways, considering the height differences between the two sides, it was Mexico who took the lead after the unmarked Enriquez directed Giovanni Dos Santos’ whipped free-kick into the net. For the second goal, the Senegal defence’s failure to clear their lines saw the ball fall to Javier Aquino who finished with aplomb. Gueye’s failure to control a square pass allowed Dos Santos clean through to cooly slot past onrushing goalkeeper Mane for the third. An equally awful error was Ba’s ill-judged header back to the keeper which lacked precision and pace and eventually resulted in Herrera restoring the two-goal advantage and putting the game to bed for once and for all. For all the harrowing defending, Senegal have a lot of positives to take away from this tournament after a disastrous Cup of Nations earlier this year. Most importantly, there has been balance and coherency in the team, wrapped with catwalk football at times. The full-backs, Pape Souare and Saliou Cisse, have been impressive, Souare, who was my man of the match but was also lucky to stay on the pitch after a kick to Herrera’s head, has shown superb delivery from corners and crosses. Sadio Mane has enthralled with his endeavour and probed the core of the opposition smartly from central midfield. Abdoulaye Ba, despite his roughness around the edges, has shown the leadership qualities and a sublime range of passing that one rarely witnesses in African centre-backs. Ousmane Mane has shown precocious abilities for a goalkeeper, not only making key saves but also having the knack of knowing when to stay on his line and when to sweep. Is Moussa a Kon Artist? The increasing belief is that you shouldn’t buy players off the back of a good tournament – it’s a sure way of buying a con artist who has successfully been able to pass off as a footballer off the back of a few good games. Once the Christian Riveros’ and Klebersons turn up for their new European clubs, they are a paradox of the zenith they reached during the tournaments. One of the stars of the men’s football tournament has undoubtedly been Moussa Konate. 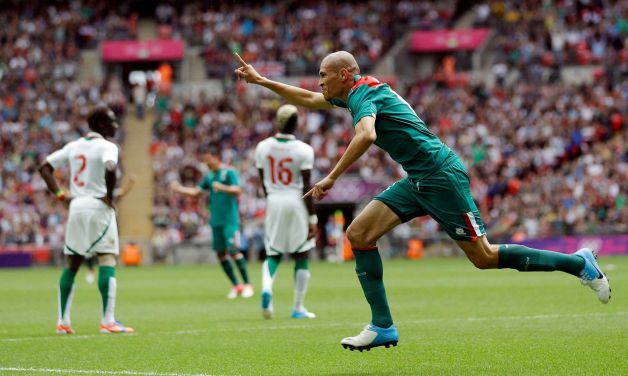 Blessed with a blnding powerfully header and a Maasai leap, the 19-year-old scored five out of Senegal’s six goals at the tournament and impressed with his marauding, intrepid runs through the centre and on the wing. It may just be the Afrocentric lad in me, but I think Konate, at only 19, doesn’t have the dreaded peripatetic air of a one-tournament wonder and possesses the dynamism which could mean he’s not a mere flash in the pan and that he’s a valuable asset wherever he ends up. West Ham are reportedly interested in plucking him from Maccabi Tel Aviv. There is an important question here: does the Senegal coach Joseph Koto have the bravura to introduce some of these players into the first XI of the full national team? Although a few were given a run-out in a recent friendly against South Africa that was nothing more than a mere taster of international football. Pape Souare has been a key component, his precise corners and crosses constantly giving the opposition problems. The phalanx of strikers at on Senegal’s register, particular Demba Ba and Papiss Cisse, would thrive from the delivery of the full-backs – it was exactly the sort of telling passes and crosses that they craved during the Cup of Nations, and the type of service they’ve thrived from at club level.